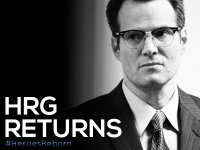 The HEROES revival, HEROES REBORN, is introducing a whole gaggle of new characters, but one original character — Jack Coleman’s HRG — will have a major presence on the 2015 limited series. While HRG will be the most forefront returning character, a handful of original stars will appear on HEROES REBORN for guest spots/arcs. One of those guest stars is Greg Grunberg (Matt Parkman), and at Comic-Con, he and Coleman touted the screen-time they got to share in HEROES REBORN. HEROES will be brought back this year with HEROES REBORN, and NBC used the Super Bowl to debut a little teaser for the event series. HEROES REBORN — the upcoming miniseries continuation of the NBC series, HEROES — has nabbed its first original series star to return, a rep for the series has confirmed: Jack Coleman (HRG)! Deadline was first to break the news. While details about Coleman’s involvement are being kept on the DL — including how many episodes of the miniseries he’ll actually appear in — NBC Entertainment President Jennifer Salke hinted back in February (when the miniseries was first announced) that familiar faces would be appearing in the show’s newest incarnation. And since HRG was always in the middle of everything, it makes sense Coleman is the first one to officially be back. Are you excited Coleman is returning to play HRG? And are there any other original characters you’re hopping show up? SCANDAL’s great guest star streak is continuing: a rep for the show confirms that former HEROES star (and occasional CASTLE baddie) Jack Coleman has signed on for a recurring (mysterious) role. Deadline was first to report the casting. Who are you hoping Coleman gets to interact with on SCANDAL?